Dental crowns, also known as caps, are fitted over worn or damaged teeth. They can also serve a cosmetic purpose, restoring a discolored tooth to its former color. During the procedure, our dentist may fit you with a temporary crown in order to protect a damaged tooth while the permanent crown is being manufactured. Crowns serve many purposes in restorative and cosmetic dentistry. They provide an integral part to support weakened or broken teeth. If left untreated dental problems can lead to uncomfortable and unhealthy ailments such as jaw pain, headaches, and bite anomalies. This could do further damage to otherwise healthy teeth. Our dentist might suggest a dental porcelain crown if you are experiencing soft or weakened teeth, to support significantly filled teeth, to anchor bridgework, restore the appearance of misshapen, chipped or discolored teeth, to cover a dental implant, cover a tooth after a root canal or to create a healthy bite. Porcelain crowns provide the most natural look and can be virtually indistinguishable from natural teeth. 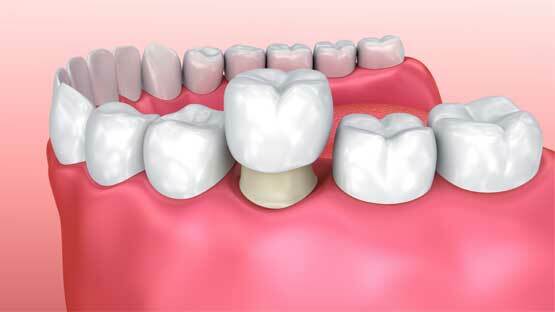 With the advancement in ceramics, they are as strong as metal or part porcelain, part metal crowns. Porcelain crowns generally wear at the same rate as natural teeth. In some cases, our dentist can create a crown for you in minutes. CEREC is an acronym for Chairside Economical Restoration of Esthetic Ceramics. This high-tech equipment allows us to restore damaged teeth with beautiful custom ceramic crowns in a single visit, completely eliminating the need or multiple appointments over several week periods. The process can create a ceramic dental crown, inlays, outlays or veneers using a variety of technologies.